So I really enjoy being creative with food, in case you didn’t already know that about me! I clearly love to bake and experiment with desserts more than anything because that is my favorite… Meal? Course? Breakfast? Lunch? Dinner? Heck- I personally love dessert any time of the day! However, Will and and I have been working really hard at eating better and working out- mostly because he is going to run a full marathon in December! Diet and working out play a huge roll in how well you do; plus- it’s always good to aim to be healthy! We’ve been working with a guy in Helena- Philip Taylor who helps you set up a nutrition plan and even helps you work out. (I’ll write another post soon about everything Will and I have been up to with working out soon that is more in depth!). Either way, we have a nutrition plan that we are supposed to stick to, and aside from our recent beach trip, we haven’t veered off course. Will is pretty good at sticking to things like this, where as I HAVE to be able to try new things, experiment, and make good fun…. Sooooo if I’m actually going to stick this out with him, I decided I would have to learn how to have fun and make food that is creative and still delicious at the same time, while falling in to our nutrition plan. (I mean… Aside from teaching, and even while I was teaching- I have always had a job that relates back to the food industry- making me appreciate all aspects of it!). So tonight I decided to make a frittata, with no cheese of course! Any time I post pictures of things I make, I get lots of questions on recipes- so I figured for once I would document what and how I made something! For those of you wanting the Barbeque Chicken Taco recipe, I haven’t forgotten! I’ll add it soon! 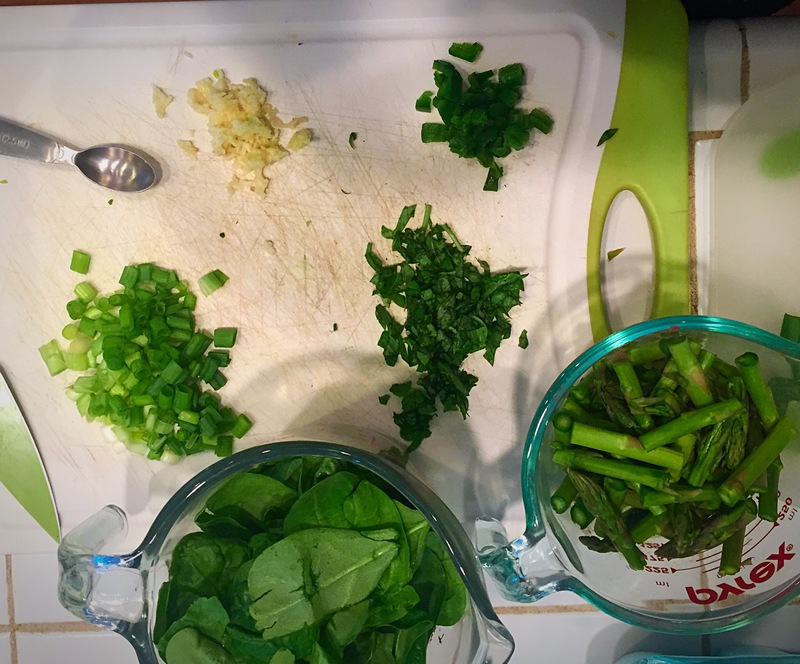 So- first things first, I like to have all of my ingredients chopped and prepped before I start- that way I can mix and pour and go as needed! Find a skillet that is stove and oven safe. I have a stainless steel skillet that works well, but you could use cast iron or Le Creuset skillets as well! 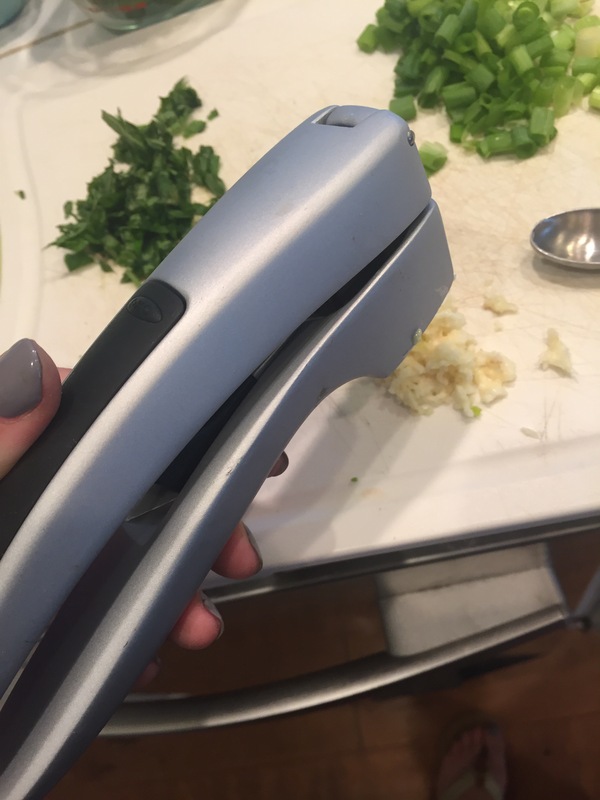 When mincing fresh garlic, invest in a garlic press! Seriously, this might be the best and cheapest kitchen tool I have EVER bought! You put the clove inside, with out cutting off ends or peeling, and press- perfect minced garlic EVERY.TIME. We use garlic a lot, so this is a necessity! 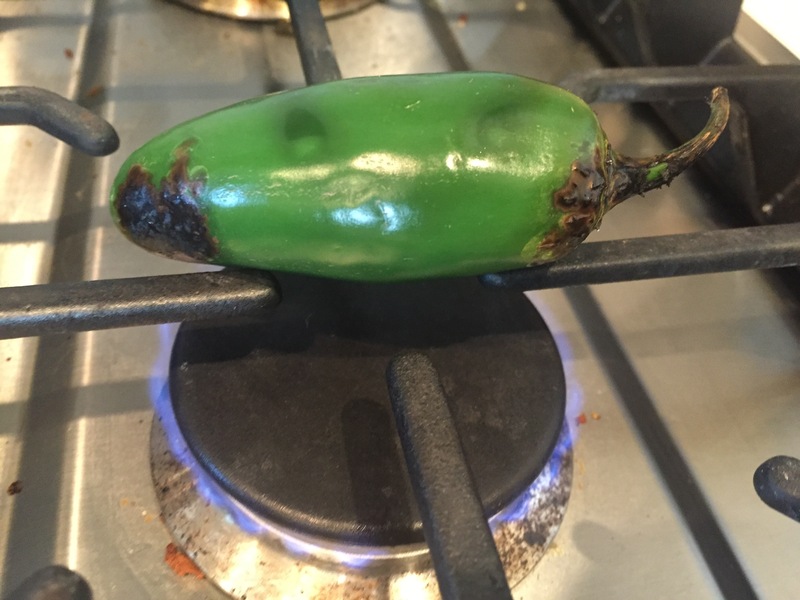 I also read the blog whatsgabycooking.com sometimes, and learned this cool trick for roasting your own jalapeño peppers! 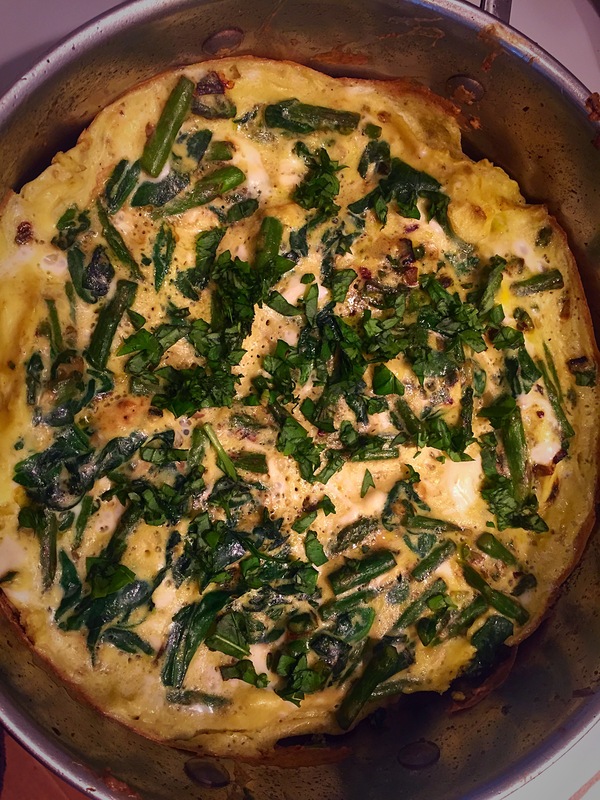 It worked great, and they added so much flavor to the frittata! You’ll roast it over an open flame until it looks like my picture/video. When it’s done, you scrape off the burnt peel, and then cut up however much you want to add to your frittata, leaving the seeds out too, or in if you like it HOT! 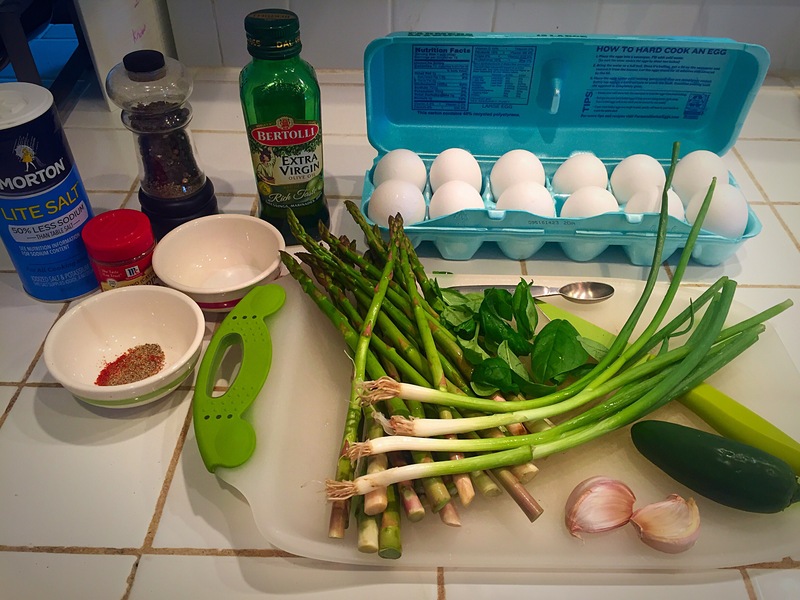 Once everything is chopped, cut up, and prepared, beat your 6 eggs, and set aside! 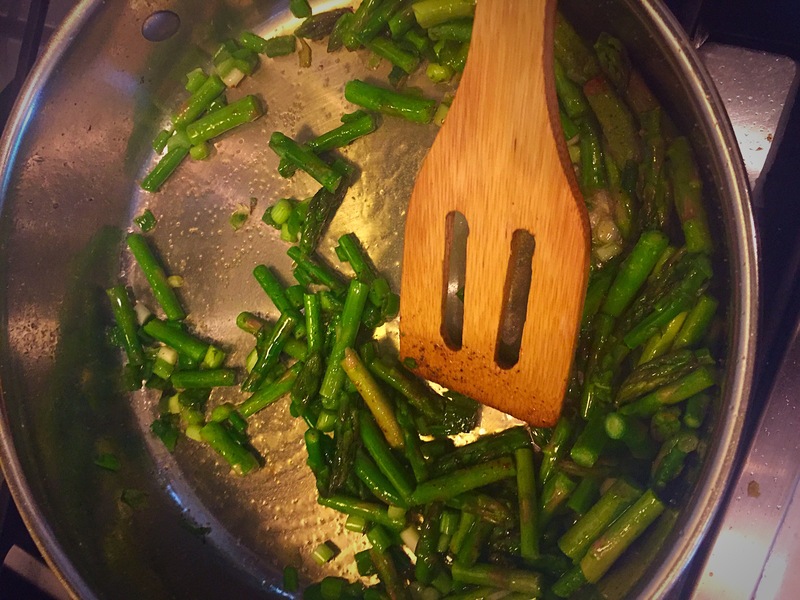 Heat your 2tbsp of olive oil over medium-high heat, and once hot, add in the 1C asparagus, 4 chopped green onions, roasted and chopped jalapeño pepper, salt, and red and black peppers- stir about 3-5minutes or until tender, and slightly brown! 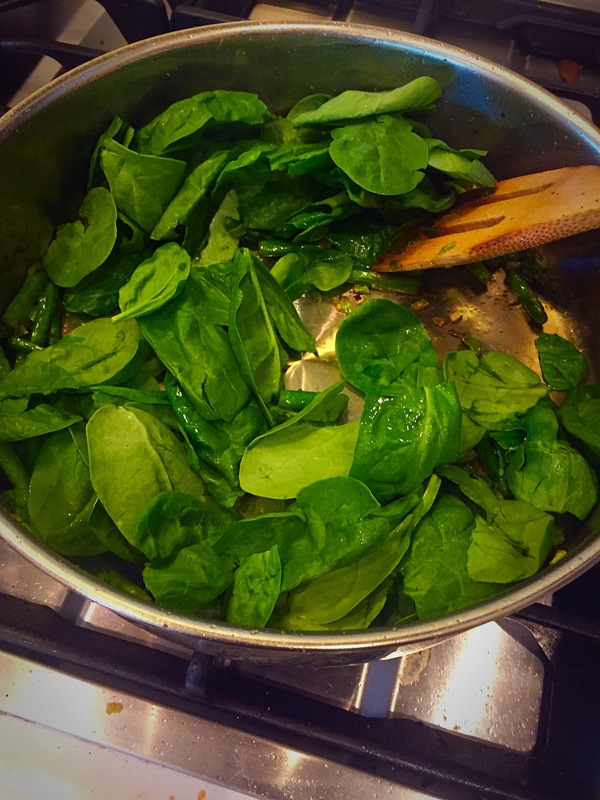 Add in the 2C of spinach, stir constantly for about 1 minute, or until wilted, and then add in your garlic- cook until aromatic, about another minute or less! 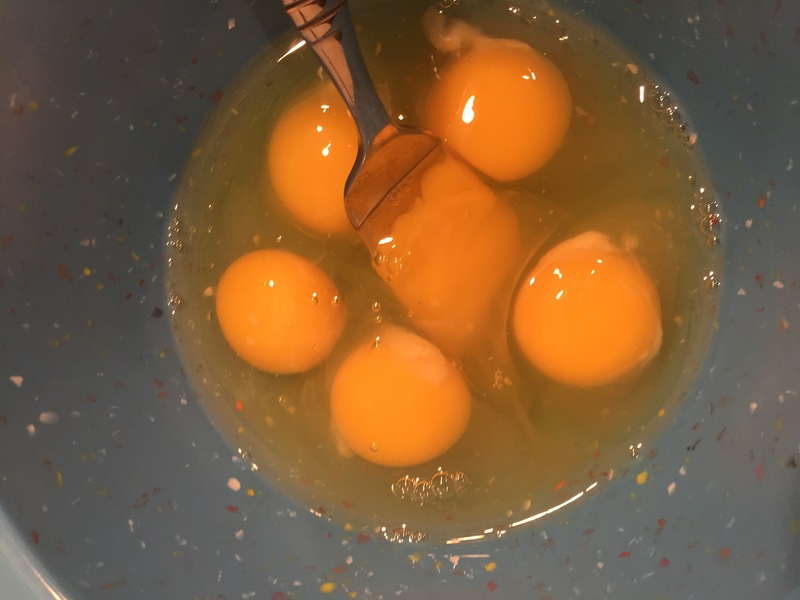 Finally, stir in the 6 beaten eggs, mix fast, and then let it set. 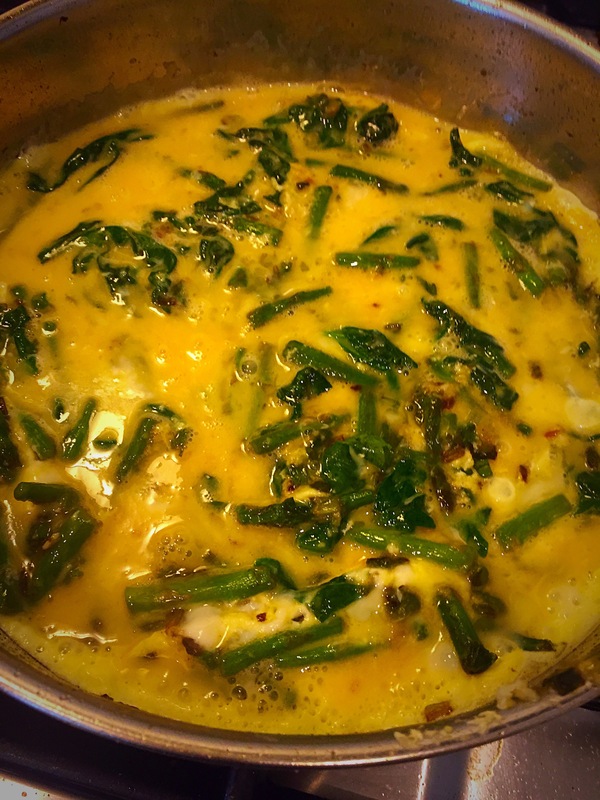 In 30-45 second increments, let the eggs cook, without stirring. Using a flat rubber or wooden spatula, pull up the side of the frittata and let the liquid egg from the top, run underneath. Repeat this step until there is no more liquid left on top! Once the liquid eggs have cooked from the top, put the entire skillet in your pre-heated 350• oven for 6 minutes. I leave the light on in my oven so I can see how it’s looking! 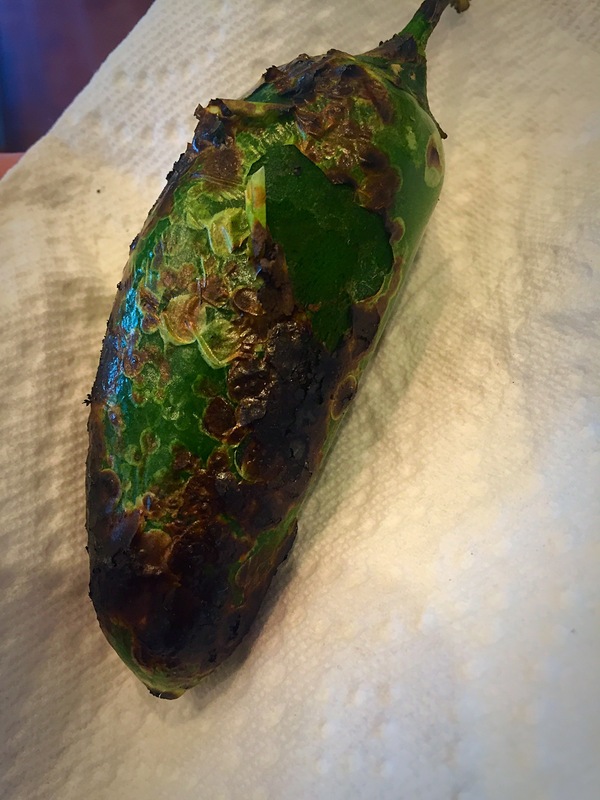 Keep an eye on it to make sure it does not burn. 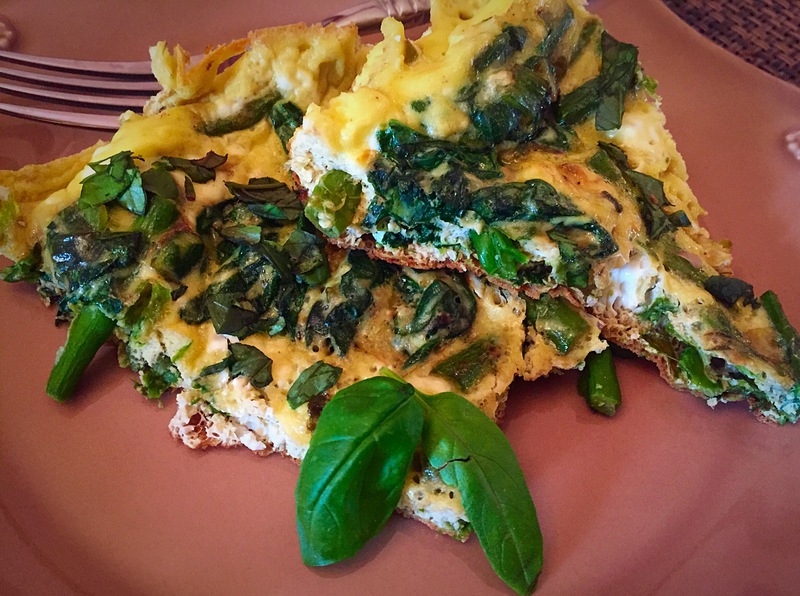 Remove your frittata and gently slide it on to a plate or pie pan; sprinkle with the fresh chopped basil! I like my frittata still warm, so I ate it immediately! However, a lot of people like them room temp, or sometimes even cooled- your choice! If you make it and like it let me know! You could also add any other veggies that you may like! Mushrooms and bell peppers would be fun! Cheese would also be a nice addition, but we can’t have any yet in our nutrition plan, so feel free to add if you like! I would add it right before you put it in the oven! Watch to see that it bubbles and browns to your liking! Either way, I hope this was helpful! Looks yummy, but I must have the cheese….the reason I’ll never run a marathon…….or any other race!